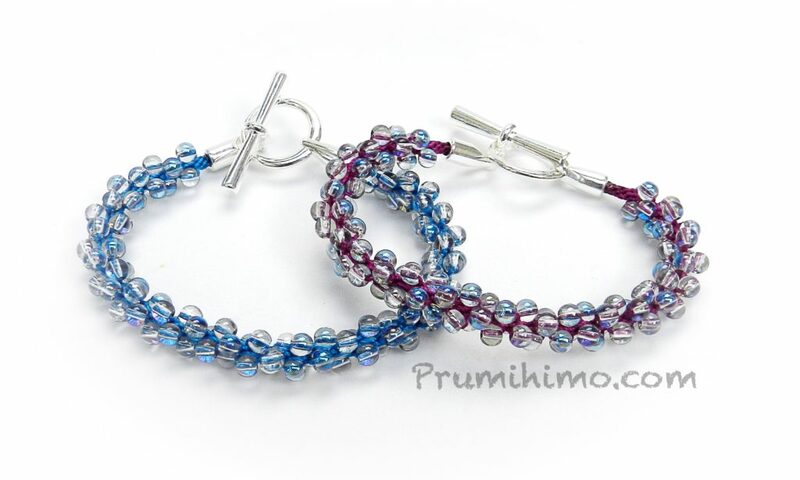 Beading cord comes in so many lovely colours that it seems a shame to cover them up and in this bracelet transparent beads are used to make the very best of the colour and texture of the cord. For the examples I have used 4mm round glass beads, but size 6 seed beads would do the same job. The braid is made on the regular round disk using 8 cords of 60cm, which is approximately 24 inches. The number of beads required will depend on the length of the bracelet, but you will probably need approximately 24-28 beads on each of the 4 cords on either side of the north and south dots. One of the features of this type of beaded braid is that it is wonderfully fluid and flexible.